These fashionable Fingerless Gloves are great accessory during the fall and winter season. They’re perfect to wear in cold offices too. They also add style to your wardrobe, serving as a terrific accessory to give your outfit a finished look. They keep your hands and wrists warm while your fingers are kept free for driving, holding a cup of coffee, and using your cell phone. 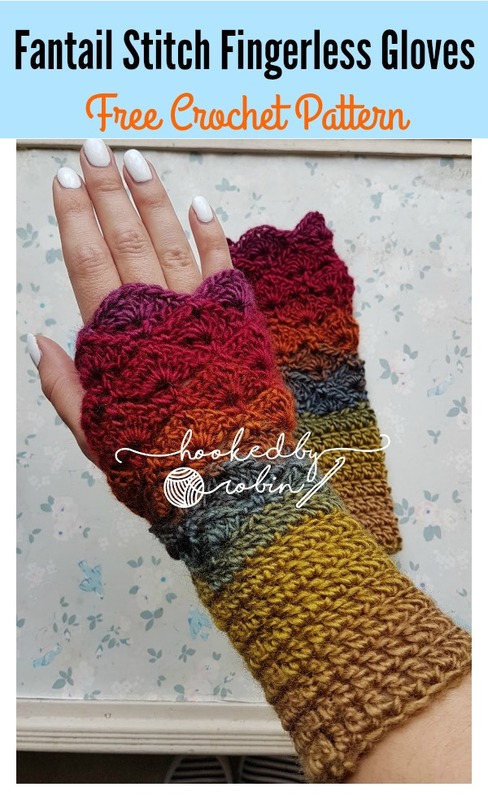 All you need is this Fantail Stitch Fingerless Gloves Free Crochet Pattern and one skein of fine weight yarn in any color to complete the easy project. They are fun to crochet and can make great gifts for the holiday season.Thanks Hooked by Robin and Dada’s Place for sharing the wonderful free crochet patterns.The links for the free patterns are provided below photos. Happy crocheting. You might also like this Beautiful Fingerless Gloves Free Crochet Pattern.